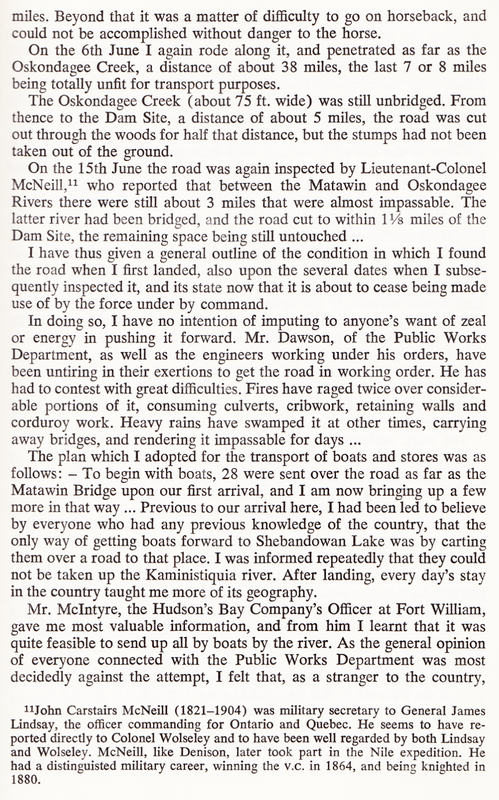 A previous post regarding the railway bridge at Sault Ste Marie made mention of the Chicora Incident and my intention to produce a short post using one reference has become longer than originally intended. Many readers familiar with Pierre Berton's The National Dream will recall the North-West Rebellion of 1885 - led by Louis Riel. CPR General Manager W.C. Van Horne used his US Civil War railroad experience, and applied it to his almost-complete transportation system ... to speed troops west to quell the Rebellion. Many Canadians will be familiar with what Berton refers to as 'the most famous photograph in Canadian history' - Donald Smith driving the last spike on the CPR at Craigellachie, British Columbia. As well as being a 'silent partner' in the CPR Syndicate, Smith previously had an extensive career with the Hudson's Bay Company and he was also involved in the birth of the postage stamp-sized province of Manitoba. Before the North-West Rebellion of 1885 was the Red River Rebellion of 1869-70. The latter resulted in Prime Minister Macdonald and Ottawa negotiating with Riel to establish Manitoba. 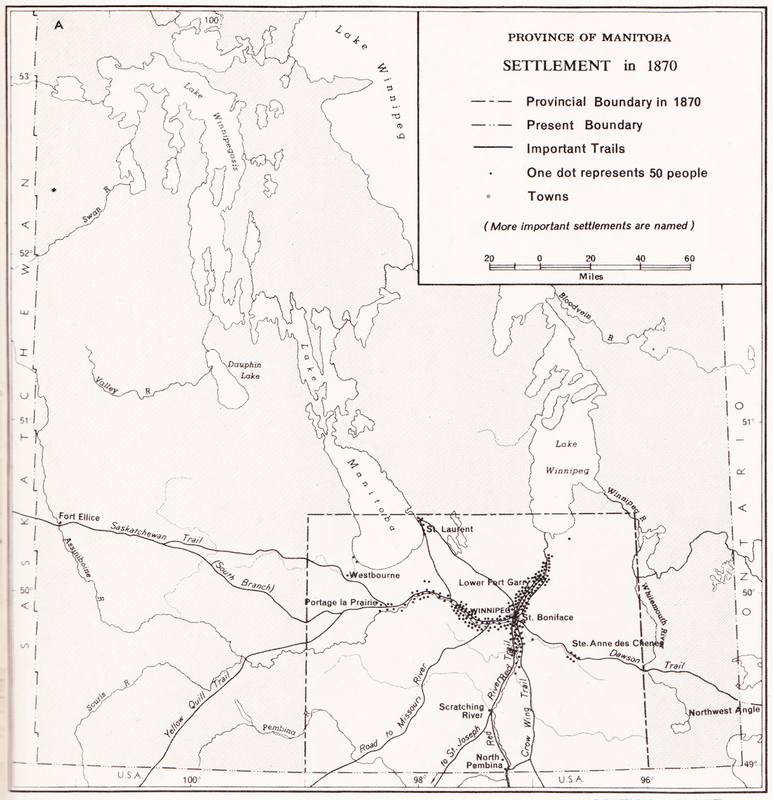 from: Manitoba Historical Atlas; Warkentin & Ruggles; 1970; Manitoba Historical Society. Note the ratio of 'Whites' to what Canadians today refer to as 'First Nations'. 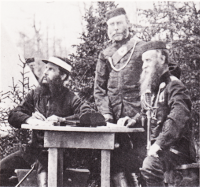 To make a long story short, the first Lieutenant Governor of the North-West Territories-designate (William McDougall, 1822-1905) was appointed by Ottawa. 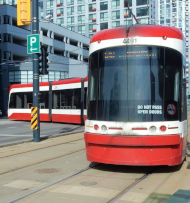 He was kind of a racist bigot from Ontario and he brought in some workers with a similar outlook to survey the whole place for a massive influx of settlers. Hopefully the latter would all be good anglo-Protestants from Ontario. Some well-established residents near the Red River (including Riel's family) owned houses and plots of land surveyed with a French river-frontage system ... but apparently this would be thrown out the window ... and the new survey would be based on a grid system. However ... the Hudson's Bay Company had not yet sold/ceded the area marked 'Hudson Bay Territory' (map below) to Canada - so Lieutenant Governor-designate McDougall and his crews were acting prematurely. 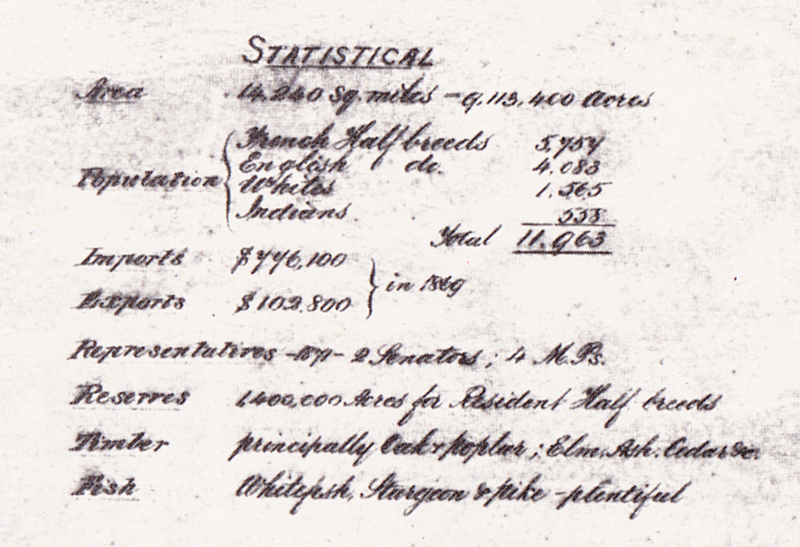 As suggested by the 1871 statistics above, many people were living out there who had never seen the key British HBC shareholders who apparently owned all the land under their feet - from horizon to horizon - and the bison which many of them hunted. Riel and company set up a government for themselves, waved guns around and exercised the authority of a government on their own land. 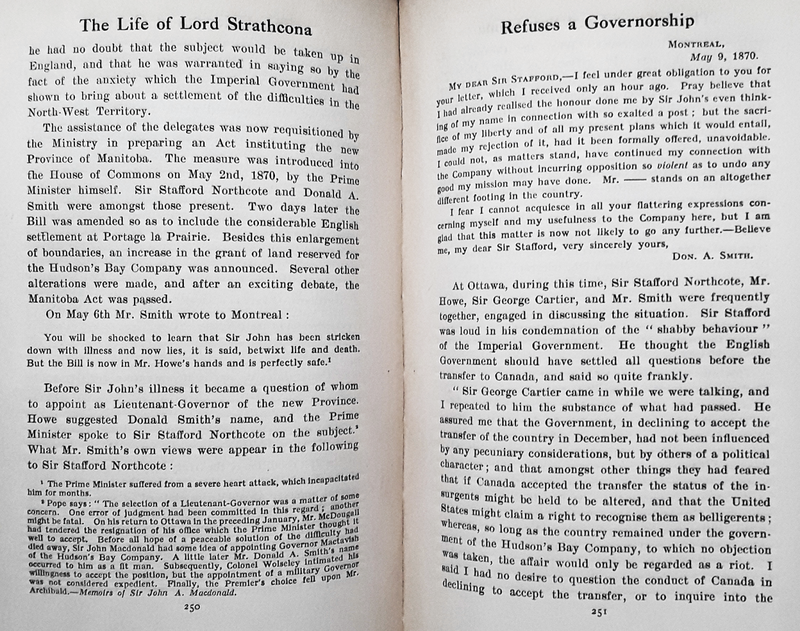 Acting reasonably under the circumstances, Prime Minister Macdonald and Ottawa dealt in good faith with Riel and his fellow Metis ... initially. However, a good show of military strength was clearly indicated ... to send a message to the people aroused by McDougall's blockhead actions and designs ... and also to impress expansionist Americans, who might north walk across the flat land along the Red River and set up their own territorial government in middle of the HBC's fertile prairie. ... The Americans had completed their Union Pacific Rail Road in 1869 and they had recent experience and transferable skills ... when it came to clearing off and taking over an area of fertile plains for agriculture. from: Canada's Five Centuries; W Kaye Lamb; 1971 McGraw-Hill. The Red River Rebellion - this was to be the western rebellion WITHOUT a railway. It was during this attempt to project military strength that the Americans put a stick in Macdonald's spokes with the 'Chichora Incident'. Some, like James J Hill and Hugh Allan, might have thought that running the mainline of the Canadian Pacific Railway south of Lake Superior and then north to the North-West Territories would be a smart idea from a business standpoint. 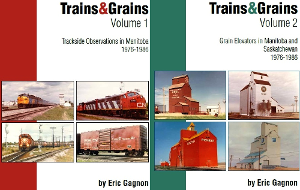 Below, two contemporary sources will help illustrate why the 1880s saw a national railway pushed through the 'wasteland' west of today's Sudbury. 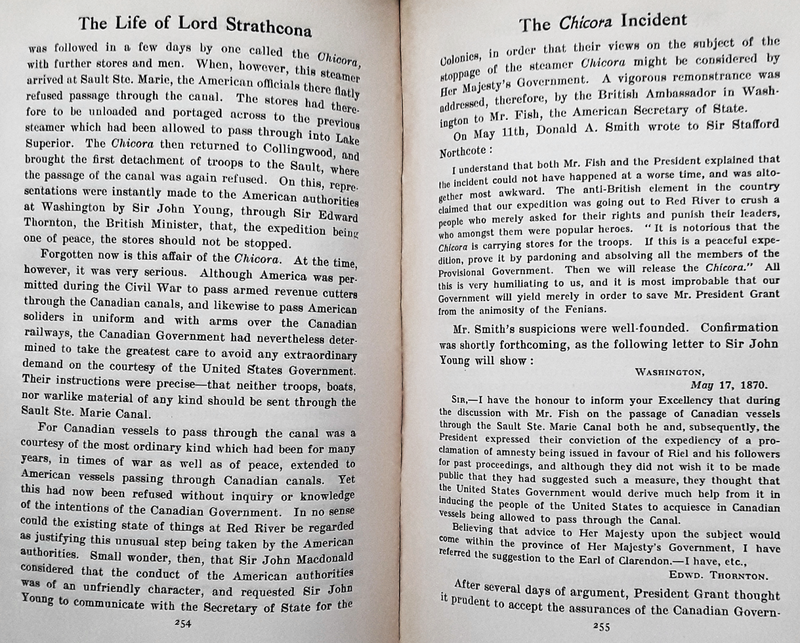 The first printed reference will describe the Chicora Incident - this is from Donald Smith's 1915 biography. 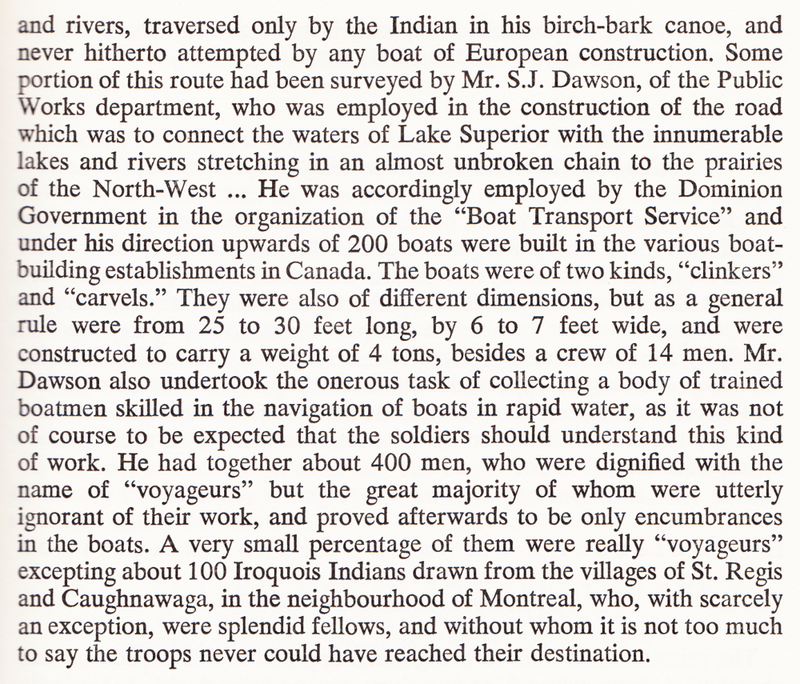 The second describes the effort to get Ottawa's Red River Expedition (troops) beyond the lakehead and through to Manitoba. 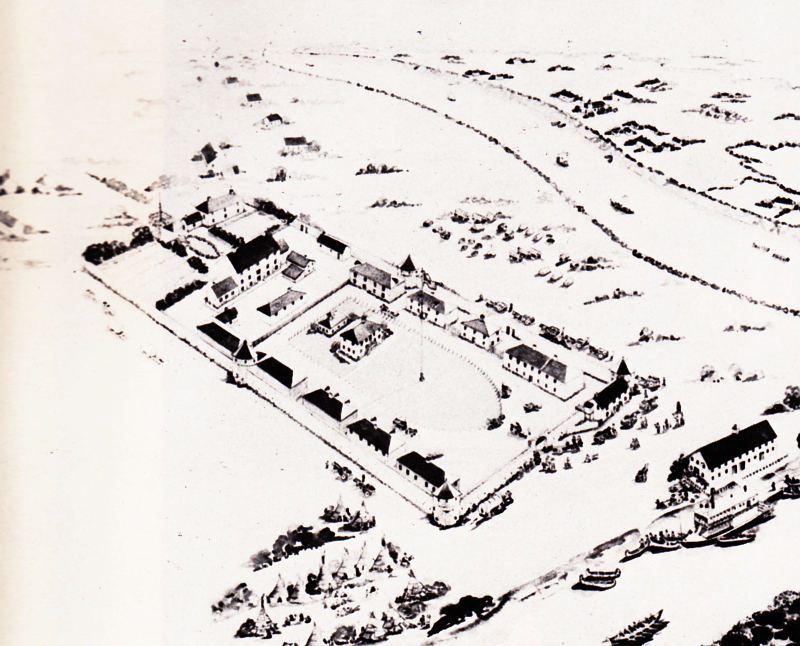 Above is a sketch of Fort Garry of the Hudson's Bay Company in 1867. This was located at the confluence of the Assiniboine (foreground) and Red Rivers. Part of the track of Winnipeg's Union Station would probably be visible in a modern view of this area. from: Railway Steamships in Ontario; Dana Ashdown; 1988; Boston Mills Press. Above: The Letter B, was built in 1864 in England. It was intended for use in running the Civil War blockade ... Union military forces blockaded the south but Britain generally supported the Confederacy. 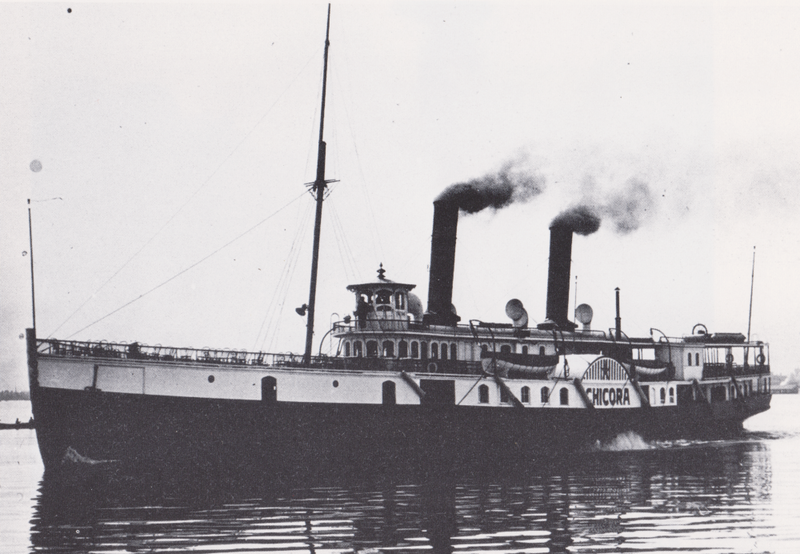 The ship arrived too late for this use and was eventually sold to The Lake Superior Royal Mail Line and renamed the Chicora. This photo shows the Chicora much later - in the early 1900s near Toronto after resale and an 1877 rebuilding. 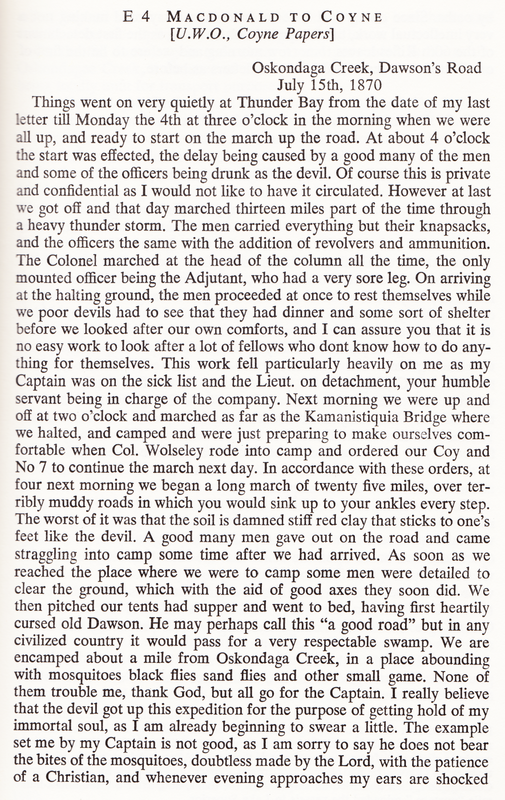 Below is Donald Smith's account of the Chicora Incident and part of the Red River Rebellion. 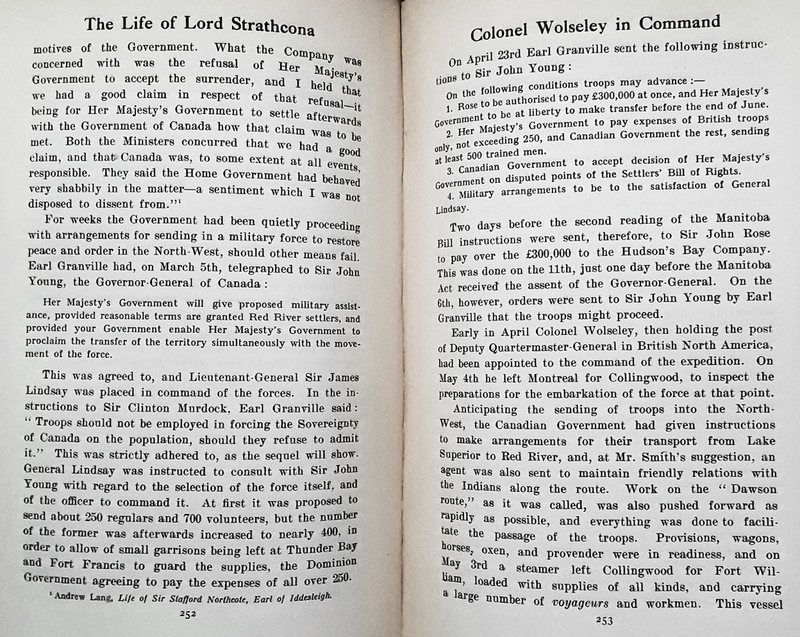 from: The Life of Lord Strathcona and Mount Royal; Beckles Willson; 1915; Cassell and Company. The images above were photographed from my copy. Here is a link to the entire book on archive . org. from: Canada, A History in Photographs; Hall & Dodds; 1981; Hurtig Publishers. Above: Soldiers of the Red River Expedition. The map section above is taken from the large map near the top showing the Hudson's Bay Territory. 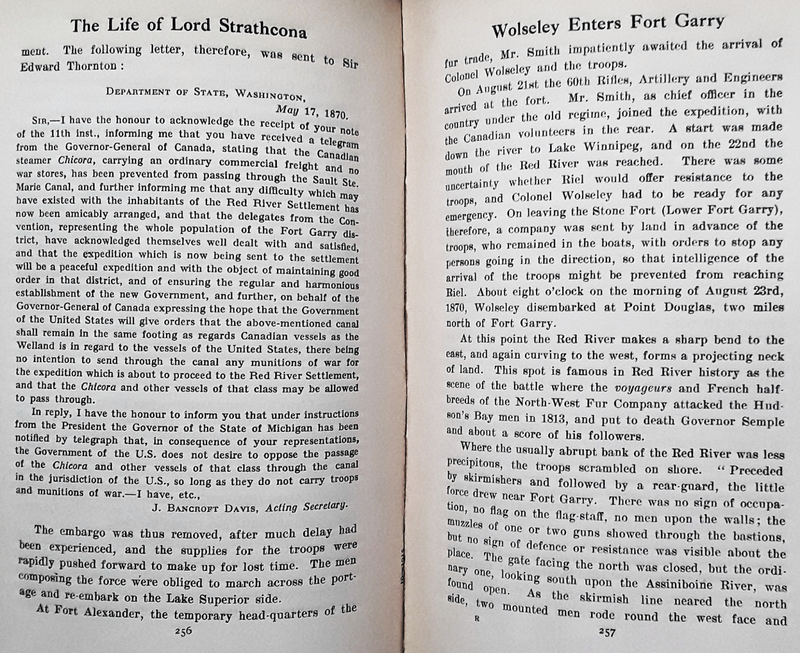 The troops were travelling from Fort William to Fort Garry through the wilderness. The map above shows the settlement pattern at the time of the Rebellion. Notice all the trails approaching from the American side. 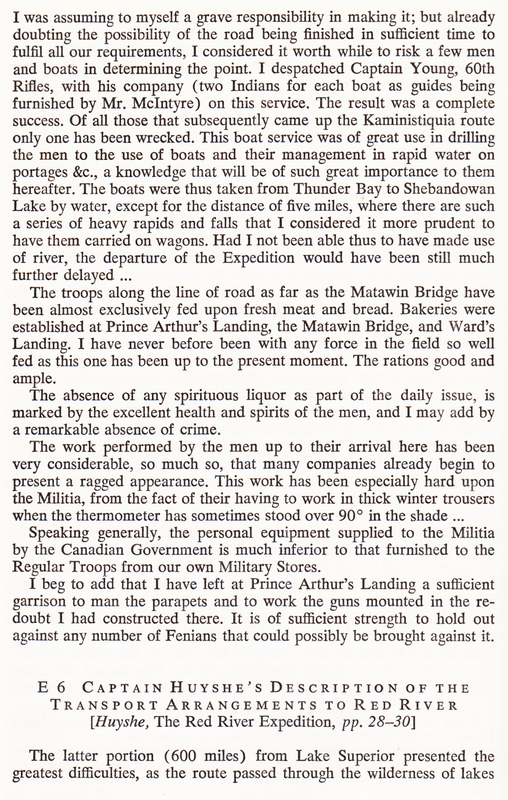 Here is a partial account of the Red River Expedition as experienced by three participants. 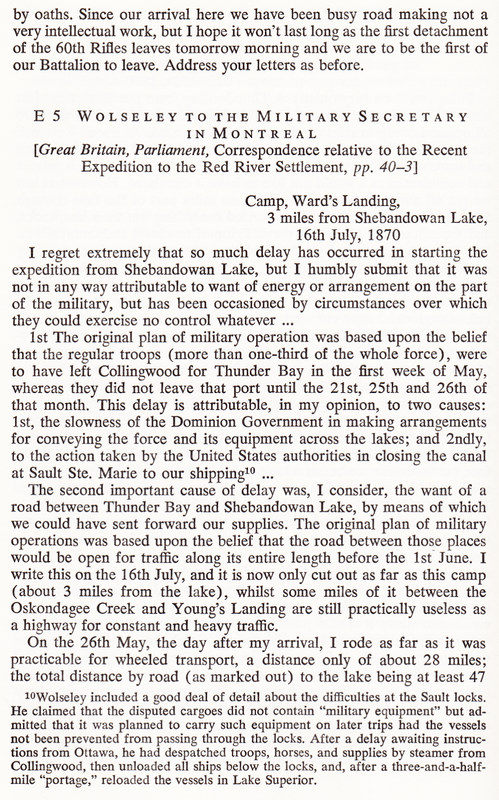 from: Thunder Bay District, 1821-1892; ed: Elizabeth Arthur; 1973; University of Toronto Press. 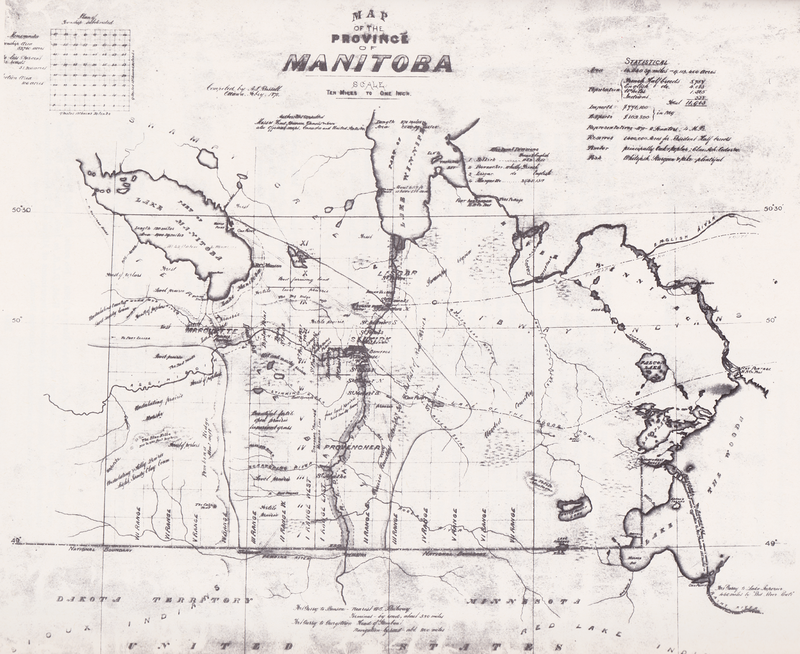 Below, the 'first map' of the province of Manitoba, 1871. 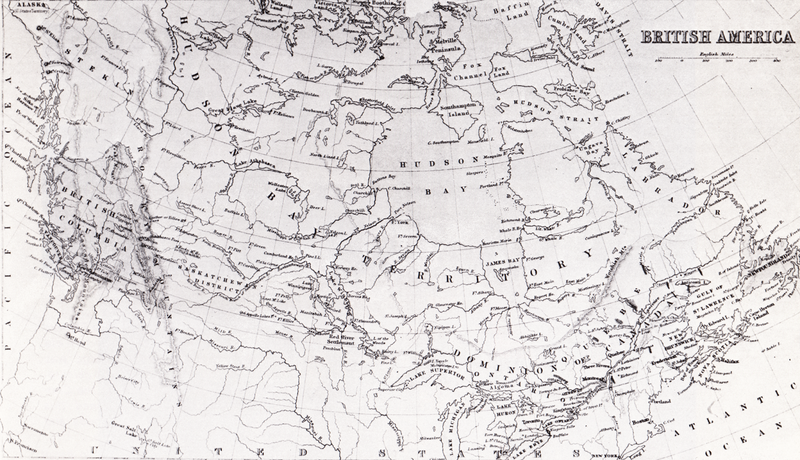 There was no record for Manitoba, British Columbia or 'the Territories' in the actual 1871 Census of Canada. It is interesting to imagine the efforts the census surveyors had to make to find and enumerate those living in Canada - particularly those in the west. 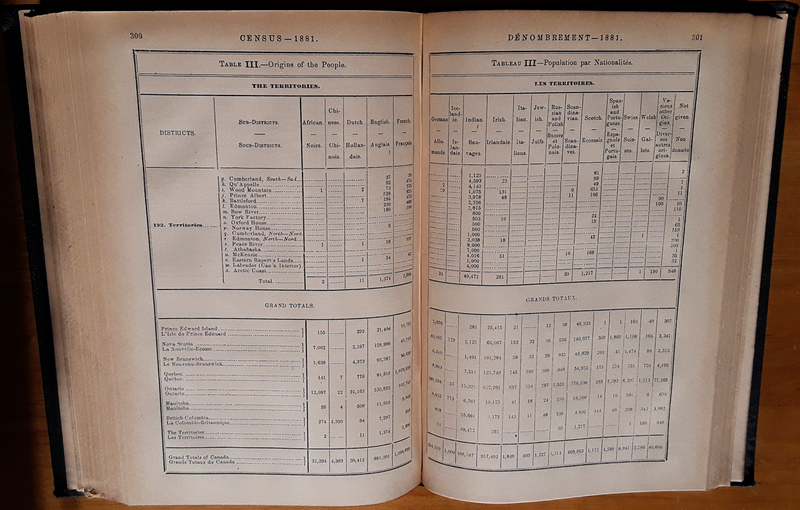 The CPR was not yet complete and travel by US railroads, by water and by horse would have been necessary ... to enumerate, and to forward the data (on paper) back to Ottawa for analysis. In recent years, some people worked very hard to discredit the 'long form' Census of Canada. It may feel anachronistic for many of us to be asked for our ethnicity or religion. In 2001, in many countries, there was a movement to have people record their religion as 'Jedi' ... and this was subsequently cited by those later working to discredit the Census of Canada. However, new immigrants to Canada have often arrived with a strong sense of who they (still) are. It is human nature that some newcomers would not want to suddenly shed their life-long identity as they would clothes. For example: Many new British immigrants to the Prairies quickly returned to fight in the Great War - they did not fight as members of Canada's armed forces. Today, there are people whose families have lived here for generations who still want to have their long-standing religious beliefs tallied. The fact that many of us have 'no ethnicity other than Canadian' and/or 'no religion' is significant in itself. These new data series can be compared with the old historical data series to see how the citizens of the country have changed how they 'self-identify' over successive generations. Considering our tale of the Red River Rebellion and the politics of Canada at the time ... those ethnic, religious and linguistic identities were very important to many citizens 'out there' and many were ready to fight to protect them. It is essential to understand the importance of these identities to better understand the history of Canada. Helpfully for us, sadly, and typically for that era of history: 'Indian' was translated to 'Sauvages' - so we are certain that the column does not refer to people from South Asia. There is no category for 'Americans' who moved north - they must generally be included in 'English' or perhaps under their original country of origin (e.g. German). There is no category for Metis. 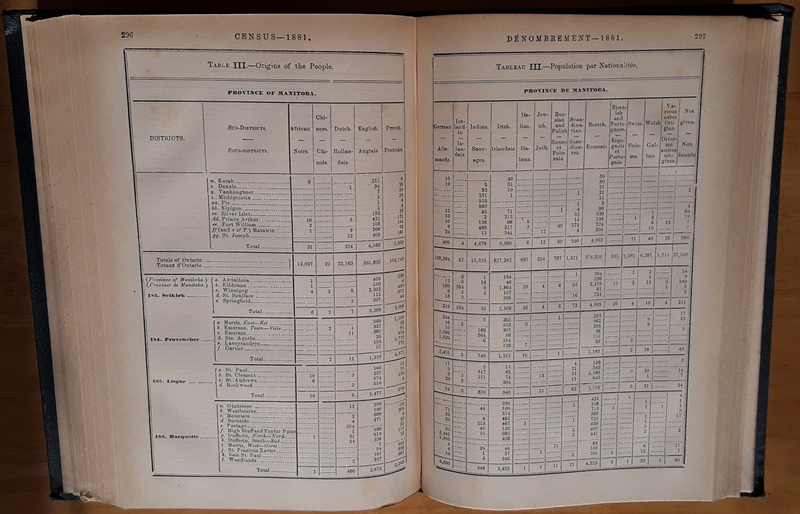 General Report of the Census of Canada, 1880-81; 1885; Government of Canada. Below, Manitoba data completes with totals, and British Columbia data begins part-way down the page. 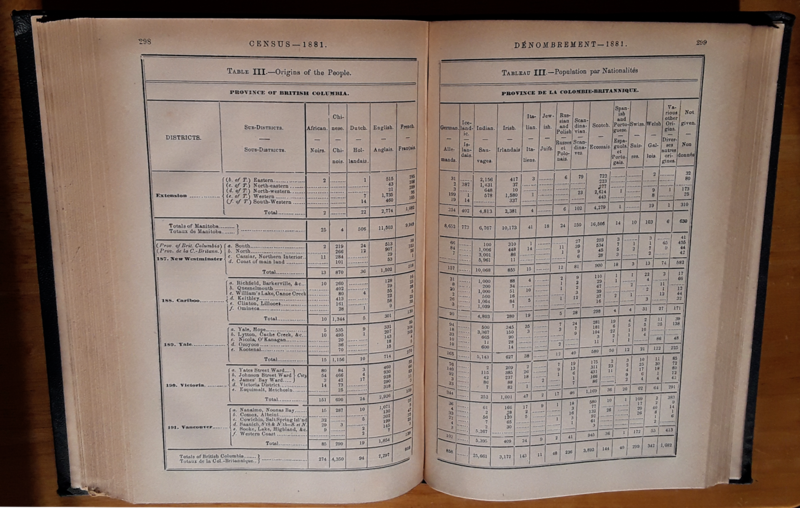 Below, data for 'The Territories' is shown. Below that, the grand totals for Canada appear.